Name Variation Ernestina Bindl was also known as Ernestine. Ernestina Bindl was born in March 1898 at Wisconsin. She was the daughter of Michael J. Bindl and Theresia Alt. As of 1940, Ernestina Bindl was never married. 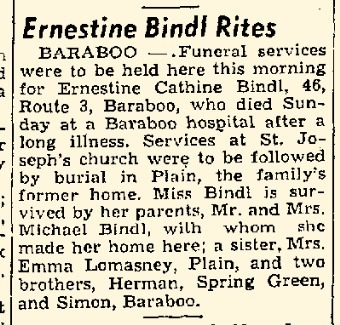 She died in September 1944 at age 46 Ernestine Bindl obituary. [S245] U.S. Federal Census 1900 U.S. Federal Census, by Ancestry.com, ED134. Dwelling 94. [S250] U.S. Federal Census 1930 U.S. Federal Census, by Ancestry.com, ED56-13. Sheet 3B. Dwelling 55. [S373] U.S. Federal Census 1940 U.S. Federal Census, by Ancestry.com, Year: 1940; Census Place: Baraboo, Sauk, Wisconsin; Roll: T627_4523; Page: 7A; Enumeration District: 56-8. Herman H. Bindl was born on 6 March 1903. He was the son of Michael J. Bindl and Theresia Alt. Herman H. Bindl married Frances B. Hausner, daughter of Michael Hausner and Barbara Roth, before 1940. Herman H. Bindl died in June 1968 at age 65. Herman H. Bindl obtained US Social Security Card at Wisconsin; last residence Spring Green, Sauk, Wisconsin. Married Name before 1940 As of before 1940,her married name was Bindl. Frances B. Hausner was born on 23 August 1906 at Wisconsin. She was the daughter of Michael Hausner and Barbara Roth. Frances B. Hausner married Herman H. Bindl, son of Michael J. Bindl and Theresia Alt, before 1940. Frances B. Hausner died on 21 September 2000 at age 94. Frances B. Hausner obtained US Social Security Card at Wisconsin; last residence Spring Green, Sauk, Wisconsin. Name Variation Margaret Frances Lehner was also known as Margaret M.
Name Variation Margaret Frances Lehner was also known as Maggie. Married Name 8 May 1911 As of 8 May 1911,her married name was Bindl. Margaret Frances Lehner was born on 30 December 1890 at Franklin, Sauk, Wisconsin. 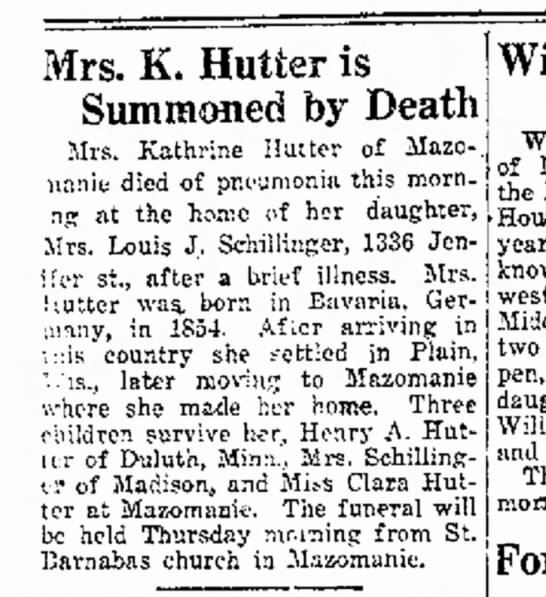 She was the daughter of Bartholomew Lehner and Frances Sturm. Margaret Frances Lehner married John O. Bindl, son of Michael Bindl and Emilia Weishahn, on 8 May 1911 at St. Luke, Plain, Sauk, Wisconsin. Margaret Frances Lehner died on 3 April 1965 at Muscoda, Wisconsin, at age 74 Mrs John Bindl (Margaret Lehner) obituary. [S245] U.S. Federal Census 1900 U.S. Federal Census, by Ancestry.com, ED134. Dwelling 101. [S243] U.S. Federal Census 1920 U.S. Federal Census, by Ancestry.com, ED178. Dwelling 74. [S250] U.S. Federal Census 1930 U.S. Federal Census, by Ancestry.com, ED56-34. Dwelling 25. [S373] U.S. Federal Census 1940 U.S. Federal Census, by Ancestry.com, ED56-36. Sheet 8a. Dwelling 122. Joseph Bindl was born on 8 May 1860 at Bavaria, Germany. He was the son of Ignatz Bindl and Catharina Roetzer. 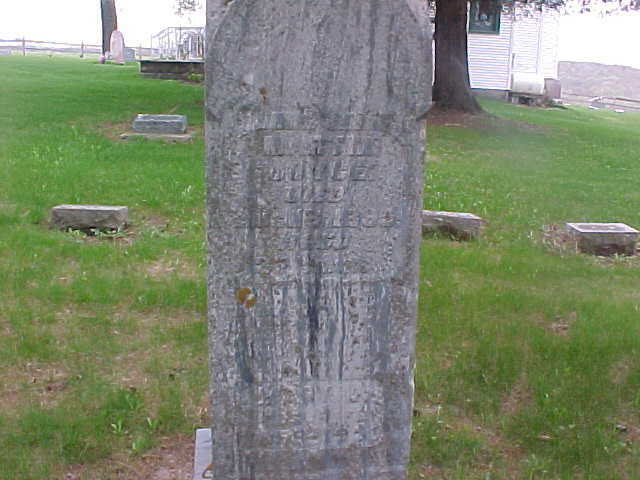 Joseph Bindl married Margareth T. Brickl, daughter of Daniel Brickl and Maria Retzer, on 8 November 1880 at Franklin, Sauk, Wisconsin. Joseph Bindl died on 22 August 1937 at age 77.
on same ship as Margaretha's future husband, Wolfgang Alt. 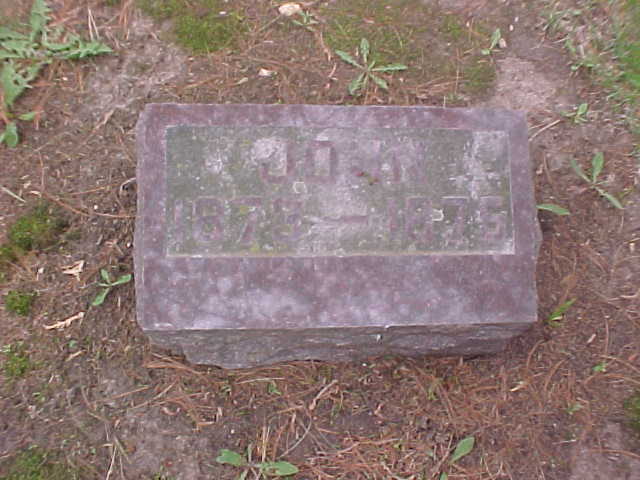 Joseph Bindl immigrated in 1864. [S247] U.S. Federal Census 1870 U.S. Federal Census, by Ancestry.com, Page 20. Dwelling 149. [S246] U.S. Federal Census 1880 U.S. Federal Census, by Ancestry.com, NA Film Number T9-1446 Page Number 101A. [S245] U.S. Federal Census 1900 U.S. Federal Census, by Ancestry.com, ED134. Dwelling 164. [S244] U.S. Federal Census 1910 U.S. Federal Census, by Ancestry.com, ED115. Dwelling 123. [S243] U.S. Federal Census 1920 U.S. Federal Census, by Ancestry.com, ED164. Dwelling 125. [S250] U.S. Federal Census 1930 U.S. Federal Census, by Ancestry.com, ED56-13. Dwelling 139. Name Variation Franziska Bindl was also known as Frances. Name Variation Franziska Bindl was also known as Franceska. Name Variation Franziska Bindl was also known as Francis. Married Name circa 1882 As of circa 1882,her married name was Lins. Franziska Bindl was born on 15 April 1862 at Bavaria, Germany, also reported as Apr 1863. She was the daughter of Ignatz Bindl and Catharina Roetzer. Franziska Bindl married John Baptist Lins, son of George Lins and Barbara Schwartz, circa 1882. Franziska Bindl died on 1 May 1939 at age 77. 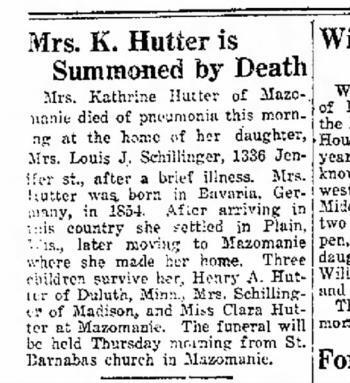 She was buried after 1 May 1939 at St Luke Catholic Cemetery, Franklin, Sauk, Wisconsin. on same ship as Margaretha's future husband, Wolfgang Alt. Franziska Bindl had 9 with 9 living in 1900 children. [S245] U.S. Federal Census 1900 U.S. Federal Census, by Ancestry.com, Year: 1900; Census Place: Bear Creek, Sauk, Wisconsin; Roll: T623_1816; Page: 1A; Enumeration District: 129. [S244] U.S. Federal Census 1910 U.S. Federal Census, by Ancestry.com, Dwelling 131. Year: 1910; Census Place: Bear Creek, Sauk, Wisconsin; Roll: T624_1736; Page: 8A; Enumeration District: 0110; Image: 783; FHL Number: 1375749. [S243] U.S. Federal Census 1920 U.S. Federal Census, by Ancestry.com, Year: 1920;Census Place: Bear Creek, Sauk, Wisconsin; Roll: T625_2015; Page: 9A; Enumeration District: 160; Image: 24. [S250] U.S. Federal Census 1930 U.S. Federal Census, by Ancestry.com, Year: 1930; Census Place: Plain, Sauk, Wisconsin; Roll: 2609; Page: 2A; Enumeration District: 26; Image: 278.0. Name Variation Catherine Bindl was also known as Katherina. Name Variation Catherine Bindl was also known as K.
Name Variation Catherine Bindl was also known as Katharine. Name Variation Catherine Bindl was also known as Anna Catherine. Married Name circa 1873 As of circa 1873,her married name was Hutter. Catherine Bindl was born on 25 June 1854 at Bavaria, Germany. Catherine Bindl married Alois Hutter, son of John Baptist Hutter and Anna Liegel, circa 1873. Catherine Bindl died on 28 December 1920 at Wisconsin at age 66.
on same ship as Margaretha's future husband, Wolfgang Alt. Catherine Bindl had 8 with 5 living in 1900 children. She had 8 with 3 living in 1910 children. [S246] U.S. Federal Census 1880 U.S. Federal Census, by Ancestry.com, NA Film Number T9-1446 Page Number 99A. [S245] U.S. Federal Census 1900 U.S. Federal Census, by Ancestry.com, ED57. Dwelling 189. [S244] U.S. Federal Census 1910 U.S. Federal Census, by Ancestry.com, ED76. Dwelling 180. [S243] U.S. Federal Census 1920 U.S. Federal Census, by Ancestry.com, ED68. Dwelling 49. Name Variation Justina Bindl was also known as Augusta. Name Variation Justina Bindl was also known as Gustina. Married Name 5 October 1876 As of 5 October 1876,her married name was Brickl. Justina Bindl was born on 20 December 1856 at Bavaria, Germany, also reported as Dec 1857. Justina Bindl married Alois Brickl, son of Daniel Brickl and Maria Retzer, on 5 October 1876. Justina Bindl died on 5 February 1944 at age 87. 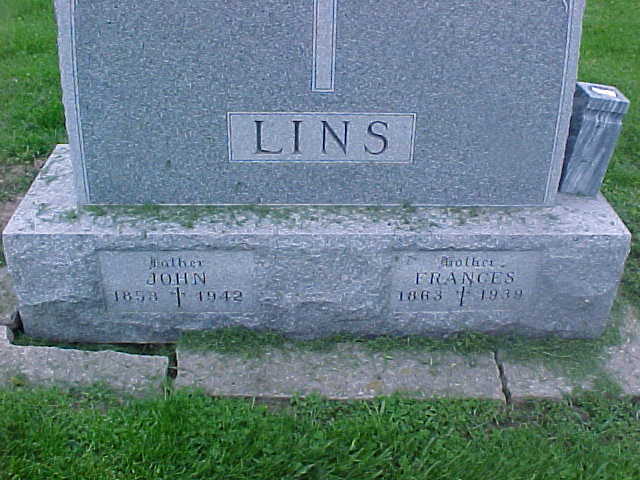 She was buried after 5 February 1944 at St Luke Catholic Cemetery, Franklin, Sauk, Wisconsin. 1 June 1905 Franklin, Sauk, Wisconsin Justina Bindl appeared on the census of 1 June 1905 in the household of Alois Brickl at Franklin, Sauk, Wisconsin. Alois and Justina Bindl Brickl. on same ship as Margaretha's future husband, Wolfgang Alt. Justina Bindl had 7 with 6 living in 1900 children. She had 7 with 6 living in 1910 children. [S246] U.S. Federal Census 1880 U.S. Federal Census, by Ancestry.com, NA Film Number T9-1446 Page Number 98D. [S245] U.S. Federal Census 1900 U.S. Federal Census, by Ancestry.com, Year: 1900; Census Place: Franklin, Sauk, Wisconsin; Roll: T623_1816; Page: 6A; Enumeration District: 134. [S244] U.S. Federal Census 1910 U.S. Federal Census, by Ancestry.com, Year: 1910; Census Place: Franklin, Sauk, Wisconsin; Roll: T624_1736; Page: 9B; Enumeration District: 0115; Image: 900; FHL Number: 1375749. [S250] U.S. Federal Census 1930 U.S. Federal Census, by Ancestry.com, ED56-26. Dwelling 21. Sheet 1B. Name Variation Margareth T. Brickl was also known as Margaret. Name Variation Margareth T. Brickl was also known as Maggie. Name Variation Margareth T. Brickl was also known as Bruckel. Married Name circa 1879 As of circa 1879,her married name was Bindl. Margareth T. Brickl was born on 4 January 1862 at Bavaria, Germany. She was the daughter of Daniel Brickl and Maria Retzer. Margareth T. Brickl married Joseph Bindl, son of Ignatz Bindl and Catharina Roetzer, on 8 November 1880 at Franklin, Sauk, Wisconsin. 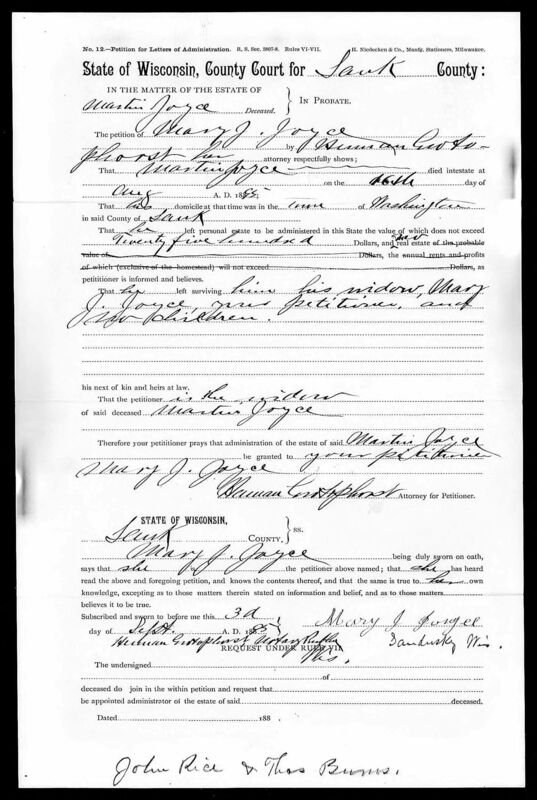 Margareth T. Brickl was listed as a beneficiary in Daniel Brickl's will on 6 September 1887 at Sauk, Wisconsin. 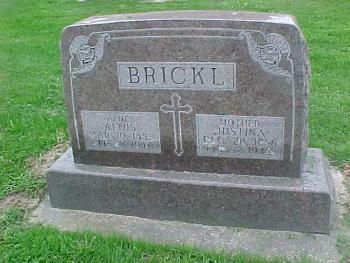 Margareth T. Brickl died on 17 April 1926 at age 64. Margareth T. Brickl immigrated in 1872. She had 5 with 4 living in 1900 children. She had 6 with 5 living in 1910 children. [S246] U.S. Federal Census 1880 U.S. Federal Census, by Ancestry.com, NA Film Number T9-1446 Page Number 95B. Name Variation Mary K. Bindl was also known as Mary C.
Mary K. Bindl was born in September 1887 at Wisconsin. She was the daughter of Joseph Bindl and Margareth T. Brickl. 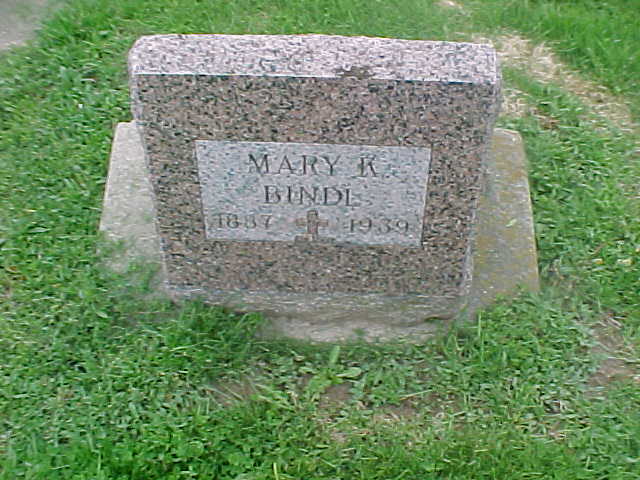 Mary K. Bindl was buried in 1939 at St Luke Catholic Cemetery, Franklin, Sauk, Wisconsin. Anna M. Bindl was born on 11 August 1883. 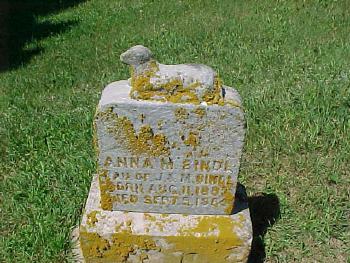 Anna M. Bindl died on 9 September 1884 at age 1. She was buried after 9 September 1884 at Old St Lukes Cemetery, Franklin, Sauk, Wisconsin. Name Variation Andreas Alt was also known as And. Andreas Alt married Anna Kiener. Andreas Alt was born before 1860 at Germany. He was the son of (?) Alt. Andreas Alt died before 1900. 20 June 1895 Franklin, Sauk, Wisconsin Andreas Alt appeared on the census of 20 June 1895 at Franklin, Sauk, Wisconsin, 3 male and 2 female; 2 born in US, 3 born in Germany; living 3 houses from W. (Wolfgang) Alt. 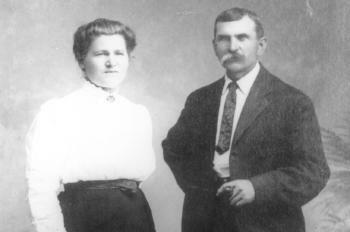 Andreas Alt and Anna Kiener immigrated in 1886. Andrew J. Alt was born on 6 October 1892 at Sauk, Wisconsin. As of 1942, Andrew J. Alt was never married. He died in October 1986. 20 June 1895 Franklin, Sauk, Wisconsin Andrew J. Alt is counted on the census of 20 June 1895 in the household of Andreas Alt at Franklin, Sauk, Wisconsin; 3 male and 2 female; 2 born in US, 3 born in Germany; living 3 houses from W. (Wolfgang) Alt. In 1942 at World War II Draft Registration, Lake, Indiana. [S250] U.S. Federal Census 1930 U.S. Federal Census, by Ancestry.com, Year: 1930; Census Place: Spring Green, Sauk, Wisconsin; Roll: 2609; Page: 3B; Enumeration District: 0035; Image: 447.0; FHL microfilm: 2342343. Name Variation Alois Alferd Bindl was also known as Alois Joseph. Alois Alferd Bindl was born on 30 August 1881 at Wisconsin. He was the son of Joseph Bindl and Margareth T. Brickl. Alois Alferd Bindl married Clara T. Lins, daughter of George Lins and Theresa Rieder, circa March 1910. Alois Alferd Bindl died in 1955. On 12 September 1917 at World War I Draft Registration, Sauk, Wisconsin. [S243] U.S. Federal Census 1920 U.S. Federal Census, by Ancestry.com, ED164. Dwelling 124. [S250] U.S. Federal Census 1930 U.S. Federal Census, by Ancestry.com, ED56-13. Dwelling 143. [S373] U.S. Federal Census 1940 U.S. Federal Census, by Ancestry.com, Year: 1940; Census Place: Franklin, Sauk, Wisconsin; Roll: T627_4523; Page: 11B; Enumeration District: 56-14. Name Variation Margareth J. Bindl was also known as Margaret. Married Name Her married name was Kreul. Margareth J. Bindl married George W. Kreul, son of Henry Kreul and Teresa (?). Margareth J. Bindl was born in January 1885 at Wisconsin. Margareth J. Bindl died in 1965. Anna M. Bindl was born in August 1895 at Wisconsin. Name Variation Clara T. Lins was also known as Carrie. Married Name circa March 1910 As of circa March 1910,her married name was Bindl. Clara T. Lins was born on 10 January 1889 at Wisconsin. She was the daughter of George Lins and Theresa Rieder. Clara T. Lins married Alois Alferd Bindl, son of Joseph Bindl and Margareth T. Brickl, circa March 1910. Clara T. Lins died in April 1983 at age 94. Clara T. Lins obtained US Social Security Card at Wisconsin; last residence Lone Rock, Richland, Wisconsin. [S245] U.S. Federal Census 1900 U.S. Federal Census, by Ancestry.com, ED134. Dwelling 177. Henry Bindl died on 1 September 1913. He was born on 1 September 1913. He was the son of Alois Alferd Bindl and Clara T. Lins. Alois Bindl was born before 1927. Name Variation Thecla M. T. Bindl was also known as Tecla. 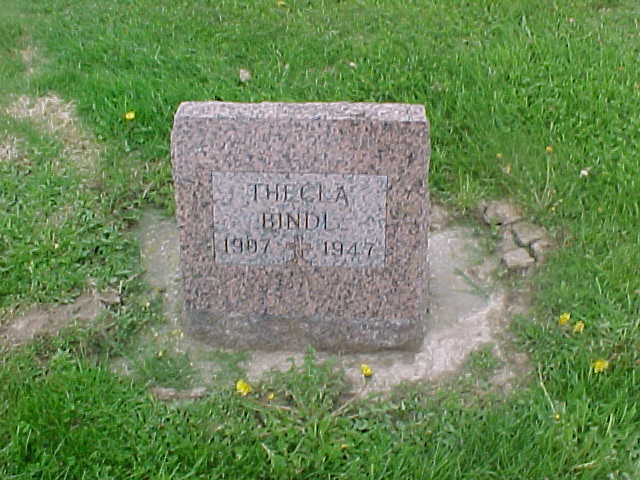 Name Variation Thecla M. T. Bindl was also known as Teresa. Name Variation Thecla M. T. Bindl was also known as Teckla. Thecla M. T. Bindl was born on 9 August 1907 at Franklin, Sauk, Wisconsin. Thecla M. T. Bindl was buried in 1947 at St Luke Catholic Cemetery, Franklin, Sauk, Wisconsin. George W. Kreul married Margareth J. Bindl, daughter of Joseph Bindl and Margareth T. Brickl. George W. Kreul was born in 1879 at Wisconsin. He was the son of Henry Kreul and Teresa (?). George W. Kreul died in 1954. [S246] U.S. Federal Census 1880 U.S. Federal Census, by Ancestry.com, NA Film Number T9-1429 Page Number 85C. 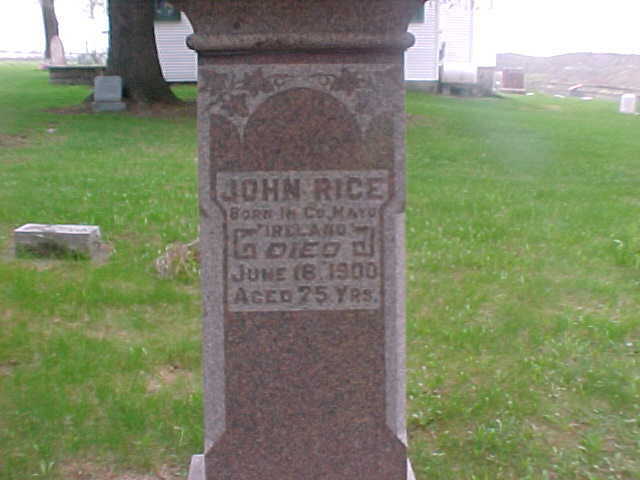 John Rice was born in 1825 at Mayo, Ireland, also reported as abt 1833. He was the son of John Rice Sr.
John Rice married Anna (?) circa 1858. John Rice died on 18 June 1900. 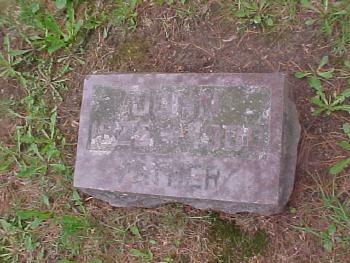 He was buried after 18 June 1900 at St Patricks Cemetery (old), Bear Creek, Sauk, Wisconsin, listed as FATHER. [S248] U.S. Federal Census 1860 U.S. Federal Census, by Ancestry.com, Page 144. Dwelling 1094. [S247] U.S. Federal Census 1870 U.S. Federal Census, by Ancestry.com, Page 13. Dwelling 92. [S246] U.S. Federal Census 1880 U.S. Federal Census, by Ancestry.com, NA Film Number T9-1446 Page Number 52A. [S245] U.S. Federal Census 1900 U.S. Federal Census, by Ancestry.com, ED129. Dwelling 103. Name Variation Anna (?) was also known as Ann (?). Married Name circa 1858 As of circa 1858,her married name was Rice. Anna (?) was born in December 1839 at Ireland also reported as Dec 1837. She married John Rice, son of John Rice Sr., circa 1858. Anna (?) 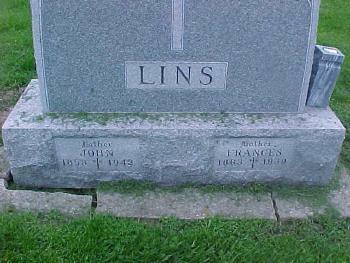 was buried in 1919 at St Patricks Cemetery (old), Bear Creek, Sauk, Wisconsin, listed as MOTHER. Anna (?) had 14 with 8 living in 1900 children. Bridget Rice was born in 1866 at Wisconsin. She was the daughter of John Rice and Anna (?). 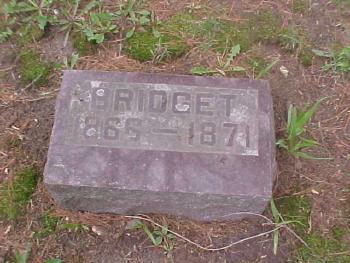 Bridget Rice was buried in 1871 at St Patricks Cemetery (old), Bear Creek, Sauk, Wisconsin. John Rice was born in 1873. He was the son of John Rice and Anna (?). John Rice was buried in 1875 at St Patricks Cemetery (old), Bear Creek, Sauk, Wisconsin. Name Variation Catherine Rice was also known as Kate E.
Married Name Her married name was Reilly. Catherine Rice was born in 1867 at Wisconsin. Catherine Rice died in 1947. Married Name before 1895 As of before 1895,her married name was Joyce. 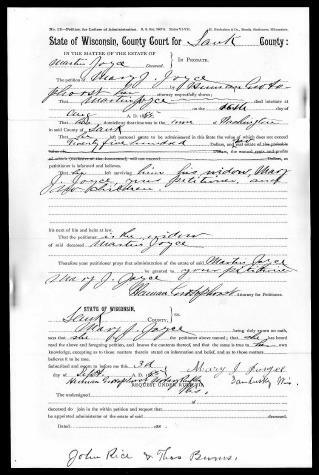 Mary Jane Rice was born in June 1860 at Wisconsin tomstones lists birth as 1858. 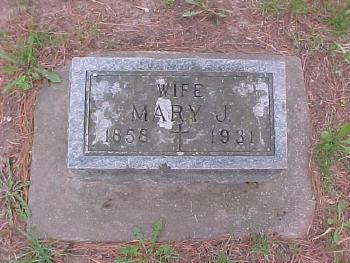 Mary Jane Rice married Martin Joyce before 1895. 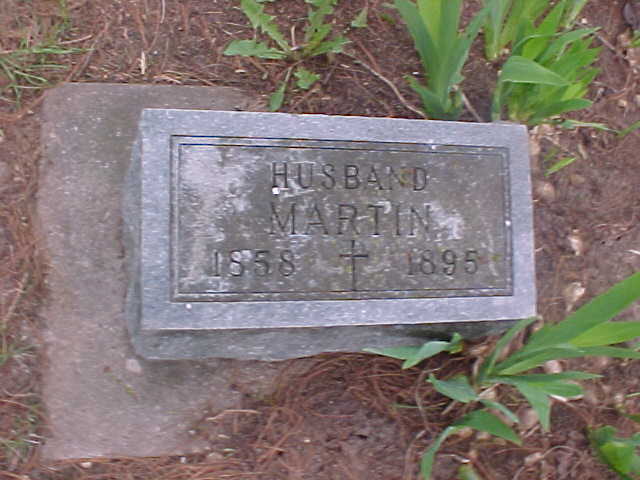 Mary Jane Rice was the executor of Martin Joyce's estate on 16 August 1895 at Sauk, Wisconsin. 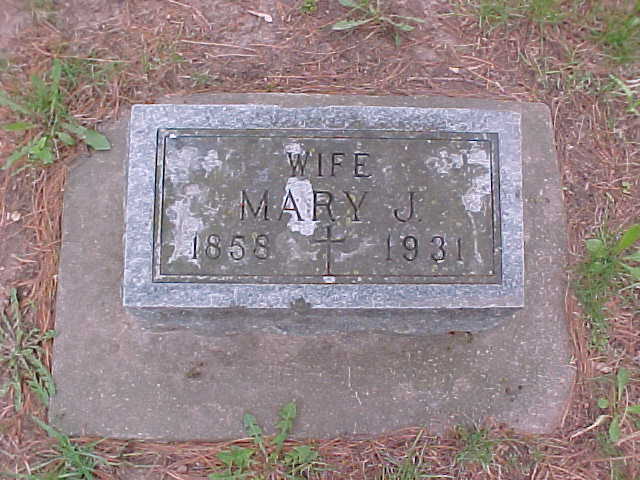 Mary Jane Rice died in 1931. 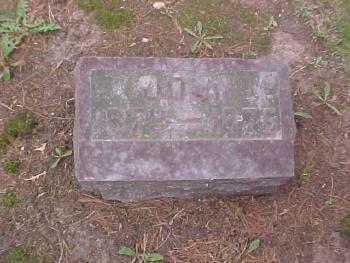 She was buried in 1931 at St Patricks Cemetery (old), Bear Creek, Sauk, Wisconsin. Mary Jane Rice had zero children. Martin Joyce was born in 1858. He married Mary Jane Rice, daughter of John Rice and Anna (? ), before 1895. Martin Joyce died on 16 August 1895. 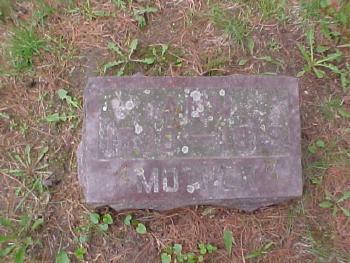 His estate was probated on 16 August 1895 at Sauk, Wisconsin. 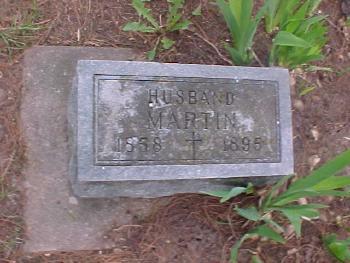 He was buried after 16 August 1895 at St Patricks Cemetery (old), Bear Creek, Sauk, Wisconsin. Sarah A. Rice was born in July 1875 at Wisconsin. 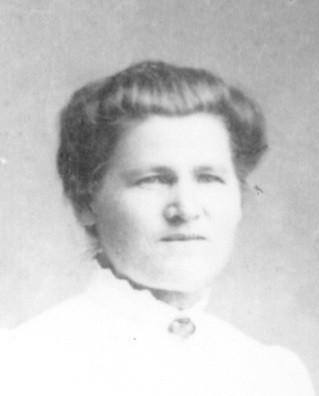 Celia S. Rice was born in June 1878 at Wisconsin.